There’s no such thing as an obese plant. But that doesn’t mean plants can’t teach us something about fat. In the September issue of GENETICS, Ducos et al. show that a protein that controls fat accumulation in humans has a similar function in Arabidopsis. 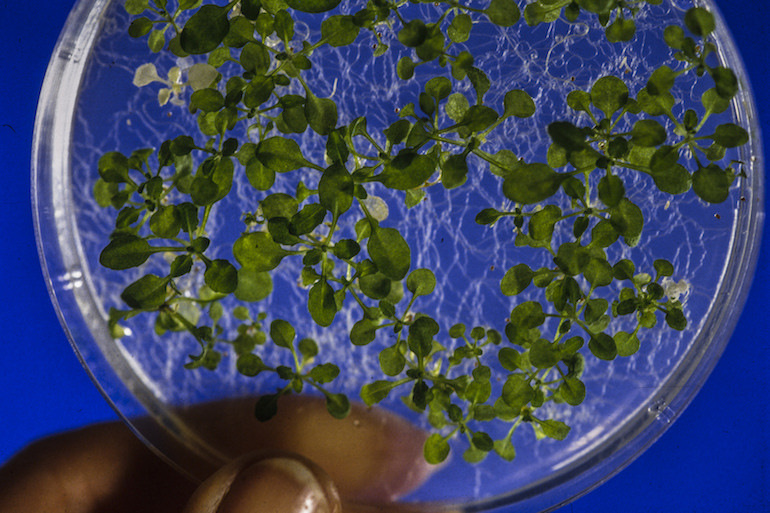 They also find that the human and plant proteins may be regulated in similar ways, indicating that the pathways controlling fat deposition have deep evolutionary conservation. In humans, the highly conserved gene WDTC1 has a well-established link with body fat content. It controls the number of fat cells present, and genetic variation in WDTC1 is associated with obesity. The encoded protein acts as a substrate adaptor protein for a ubiquitin ligase complex. It is made up of several characteristic repeat structures, which Ducos et al. noticed were similar to the structure of the Arabidopsis protein ASG2. This gene was known to regulate seed germination in some way, but it was not known whether it was an ortholog of WDTC1. To confirm the relationship between these plant and animal genes, the researchers first looked for other highly similar proteins in existing sequence databases. A phylogenetic analysis showed WDTC1 and ASG2 cluster together among all the examined sequences from plant and animal, but rarely with fungi groups. ASG2 is also widespread among plants and is found in rice and other diverse species, supporting a very old origin for this gene. The structural similarity of the introns and exons of the plant and animal genes further suggest they arose from a shared common ancestor. But does the plant version of this gene still function in fat regulation? To test this idea, the researchers knocked out ASG2. Seeds made by these mutant plants were heavier and contained higher levels of monounsaturated fats. They also had denser networks of oil bodies, the structures where fat is stored. These mutant seeds were essentially “obese,” showing that the animal and plant proteins are not only structurally similar, they have similar functions. Some other shared aspects of the structure of these two proteins even suggest that they share the same downstream binding partners, though more work is needed to confirm this possibility. The remarkable functional conservation of this obesity-linked gene suggests the pathway plays a crucial role in physiology. But fat and oil accumulation are important for more than human health; increased seed fat levels could prove a major boost to crops being bred for biodiesel and food oils.